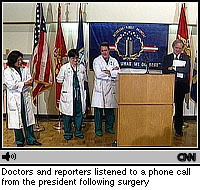 White House Press Secretary Mike McCurry and Clinton's team of doctors describe the successful operation..
McCurry and Dr. David Wade of Bethesda Naval Hospital discuss the president's impending surgery. BETHESDA, Md. (AllPolitics, March 14) -- President Bill Clinton is resting after undergoing a two-hour operation this afternoon to repair a tendon in his knee that he tore early this morning in Florida. Clinton's doctors at the Bethesda Naval Hospital declared themselves pleased. "We were very happy with our repair," said David Adkison, the chief surgeon, in a post-operative news conference. "He has an excellent chance to regain full motion in his knee." "He wants to know when he can swing a golf club," Adkison said. "We'll see." Adkison later said it would probably be six months before Clinton is able to play his full game. Adkison said he and Clinton chatted throughout the procedure, talking about their shared musical tastes, including Lyle Lovett, whose music they played during the surgery. 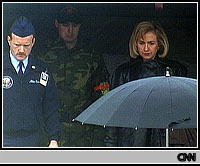 Clinton recommended several compact discs to Adkison. The president, in Florida for fund-raising events and a golf tournament, slipped on some steps while leaving the home of golfer Greg Norman at about 1:20 a.m. According to his doctors, Clinton suffered more than a 50 percent tear in the quadriceps tendon of his right knee, a very painful injury. He injured a ligament in that same knee 17 years ago while skiing. It's the second metaphor the president has turned into reality this week. First, he introduced a transportation spending plan that he said would literally build his bridge to the 21st century. Now, of course, he is an actual lame duck. 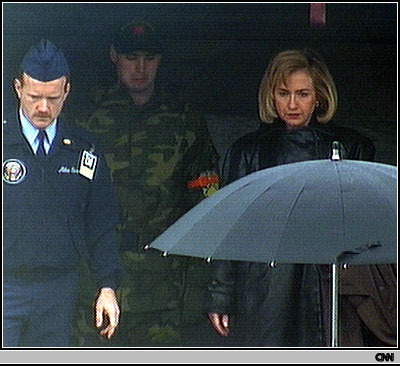 Clinton flew back from Florida this morning (1MB QuickTime movie) and arrived at the Bethesda Naval Hospital about noon ET. As the president attempted to maneuver into a vehicle to go to the hospital he appeared to be suffering some pain, but smiled for reporters. David Wade, chief of clinical staff at Bethesda, told reporters that the procedure is "not a terribly complicated operation to perform." Adkison first made a four- to five-inch incision just above Clinton's knee, then drilled two holes in his kneecap and sutured the tendon to it. The procedure went a little longer than anticipated; it had been expected to take an hour to 90 minutes. Adkison said Clinton had suffered an unusual tear. "It tore in a way where there actually still was some of the tendon attached to the bone, which is uncommon, where there was a fairly large amount still attached to the bone," he said. Clinton was given regional anesthesia via an epidural and no presidential powers were turned over to Vice President Al Gore. Wade noted beforehand that most people who undergo this kind of surgery have only a regional anesthetic and not a general one. White House Chief of Staff Erskine Bowles was on hand to handle transferring power to Gore if it had become necessary to do so. First Lady Hillary Rodham Clinton has decided to delay by 24 hours her departure on a planned two-week trip to Africa; she had been scheduled to leave Saturday. White House Press Secretary Mike McCurry said, "The president considers that a very important trip, and she fully intends to go ahead with her travels as well, although they'll consult on the schedule after the procedure." The vice president was in San Bernardino, Calif., today for an education event at a local elementary school. He had been scheduled to head back to Washington tonight and did not alter those plans. Doctors say that while the damage to Clinton's knee is substantial, the repair is not difficult or uncommon. But the recovery will be slow; they estimate that Clinton would be on crutches for two to six weeks, and could undergo months of physical therapy. The president is expected to stay overnight in the hospital. Doctors will decide Saturday if he needs to stay another night. Aides described the president's mood as good before he went into surgery; he was said to be unhappy only that he won't be able to play golf for a while. McCurry said Clinton is looking forward to catching some of the NCAA college basketball tournament.